I picked up out last winter farm share this week which makes me sad just thinking about it. Where am I going to get my food? Luckily it's only like 3 weeks until the summer share starts so I think I will survive. At the last pick up we got the usual roots, cabbage,and greens, but we got a bunch of spring greens. 3 lbs of them and I was just all smiles and glee. I legitimately get super excited when there is a large quantity of fresh spring greens in my fridge. Greens make me happy. And of course I share my green wealth with the mr. (I am so nice) He is not thae biggest fan of just handfuls of greens to the mouth for dinner so I figured a nice dressing to dress up those greens and any other veggies was something I could do. And I just so happen to have bought a giant bag of walnuts and walnuts go great with everything so yeah. And it's really freaking good. The stuff. Walnuts, oil(I used avocado but walnut or olive oil would be great) a lemon, a little honey, and salt and pepper. Also probably going to need a little water. Stuff goes into blender and gets blended until creamy. This dressing starts off really thick and can be left thick or a little bit of water can be added to thin it out. Up to you. Poured into a jar and that's that. Not just a salad dressing. You can eat it with anything and everything. I was dipping carrots and apple slices in it and the mr was dipping his pizza in it cause that's how we roll. 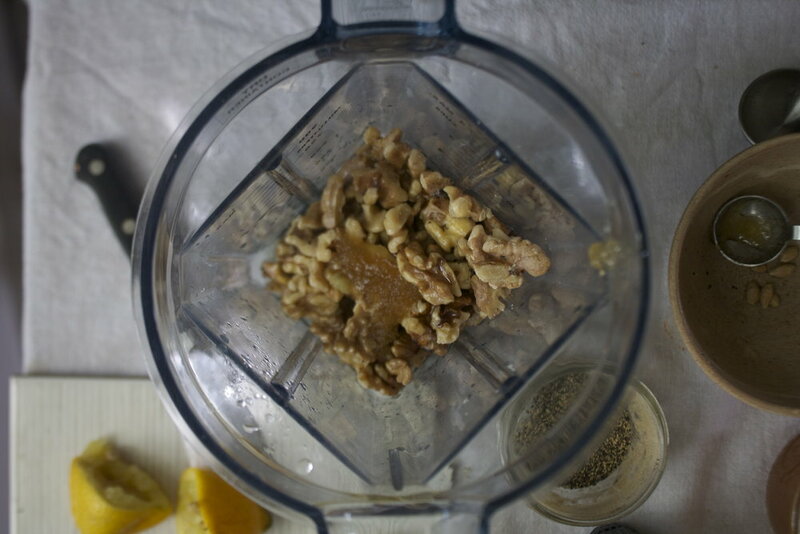 Place walnuts, juice of lemon, honey or agave, and a pinch of salt and pepper into a blender or food processor. pulse to break up nuts then turn on and stream in oil. Blend until smooth, adding a few tablespoons of water to thin out as needed. This is a thick dressing so you can add as much water as you like to thin it out, just do it slowly. When blended, taste and season with more salt and pepper if needed. . Pour into a jar. Stick in the fridge when not in use. Will last a couple of weeks if you don't eat it all.